Students engage in the new Amicus Foundation Innovation Space at New Canaan Country School. 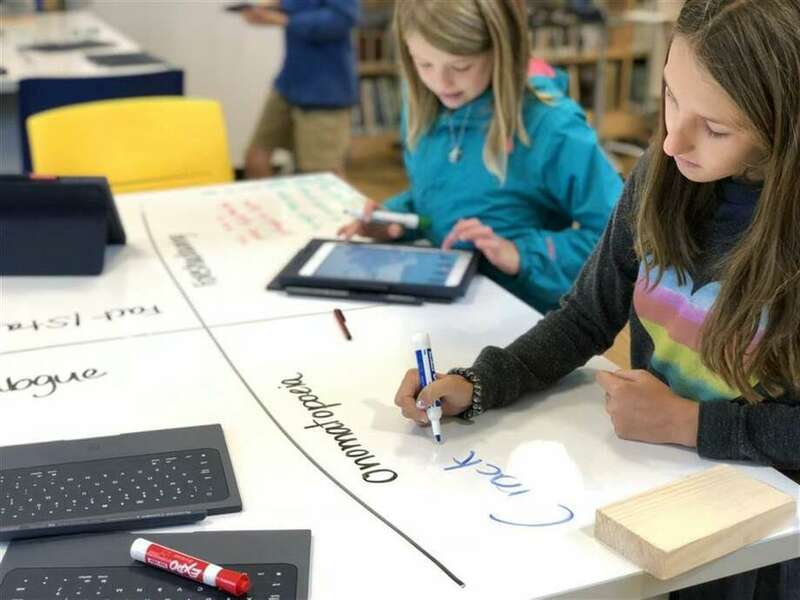 With the addition of the new Amicus Foundation Innovation Space at the New Canaan Country School, the John Christophe Schlesinger ’89 Library has become a hub of inspiration and collaboration, combining the best of traditional and cutting-edge resources, according to a news release. The space was designed to offer flexibility with moveable furniture, write-on tables, and a variety of seating (or standing) options, in addition to shelves stocked with books and robotics kits. In less than three months, it has served as a cozy space for parent coffees, a design studio for engineering challenges, a quiet research space for history classes, an electronic music studio, a collaborative think tank space for the board of trustees, a meeting place for friends, a hub for homework central and the after-school kindergarten “Mighty Makers” club, a race track for mini robots, a launchpad for the new virtual reality drone club, a home for the Festival of Books book fair, and much more. “This space just invites you to dream,” said Director of Innovation and Academic Technology Aron Back, who shares the space with veteran librarian Mary Ann Landsdale. One of Back’s goals of the school’s innovation curriculum is to expose students to technology including robotics, virtual reality and artificial intelligence. A highlight for him has been watching faculty find new ways to integrate the technology with other academic disciplines. “It allows the teachers to think very dynamically about their curriculum and ways to enhance or change what they’ve been doing,” said Back. Another objective of the new space is to encourage students to practice their mission skills: teamwork, creativity, ethics, resilience, curiosity and time management. The 34th annual production of “The Nutcracker Ballet,” presented by New England Academy of Dance and New England Dance Theater, will have three performances at New Canaan High School on Dec. 7 at 7 p.m., Dec. 8 at 4 p.m. and Dec. 9 at 4 p.m. There will be an interactive children’s performance on Dec. 8 at 11 a.m.
New Canaan High School senior Rose Engel stars as the Sugar Plum Fairy. “The Nutcracker Ballet” follows the enchanting journey of young Clara, who receives a nutcracker as a gift on Christmas Eve. In her dreams, her nutcracker is transformed into a handsome prince, who leads her on a magical journey through an enchanted forest to his Palace of Sweets where she meets the exquisite Sugar Plum Fairy and the people of the Land of Sweets. NEAD’s “Nutcracker Ballet” is the only full-length production in the region to feature dancers accompanied by a live performance of Tchaikovsky’s masterpiece by the Norwalk Symphony Orchestra, under the direction of Jonathan Yates. Seating for NEAD’s annual Nutcracker is reserved and tickets are available online. For information, visit www.neadance.com/donate. First County Bank, located in New Canaan, has gifted $100,000 through its First County Bank Foundation to the Stamford Museum & Nature Center, according to a news release. Specifically, the gift is supporting the ongoing educational programs at the museum’s new Knobloch Family Farmhouse, that will serve children and adults from New Canaan and throughout Fairfield County. This gift will be paid in $20,000 installments over a five-year period. Since 2001, the First County Bank Foundation has awarded nonprofit organizations individual grants worth more than $8.5 million. First County Bank has been a longtime supporter of the Stamford Museum & Nature Center, including executive leadership participation on the board of directors and Campaign for Future Generations Committee, as well as support of year-round events including sponsorship of the annual Maple Sugar Festival. The new Knobloch Family Farmhouse includes an indoor gathering space for nature and agricultural experiential learning, an overlook terrace with views of the museum’s existing landscape and pastures of Heckscher Farm, as well as a large multipurpose room and mobile teaching kitchen. Enrichment programs will be held year-round for school groups, campers and families. On Dec. 12 at 7 p.m., the NCHS Concert Choir and Madrigal Ensemble will perform in St. Mark’s Episcopal Church, 111 Oenoke Ridge, directed by Sarah Gleason and accompanied by Tomoko Uchino on piano, and a faculty and student string quartet. The evening will feature both choral ensembles and student soloists in this one-hour performance. Ensembles will preview selections from their upcoming Carnegie Hall performance taking place in April 2019, including a contemporary choral work with string quartet by Grammy-award-winning composer Eric Whitacre, as well as a selection of African-American spirituals. This annual concert is free and open to the public. The choral program also concluded its annual Grapefruit Fundraiser the first week in December, with 1,020 boxes already preordered and over 180 being donated to local food banks. Visit the NCHS choir website for information about its program and upcoming performances.